Besides the pricing and aesthetics, one of the most important parameter you should consider is the project location. While there are hundreds of residential projects planned in Lucknow, Paarth Infrabuild is one of those real estate brands that are often praised for their credibility and their ability to keep up the promise. The builder is coming up with their brand new residential development Paarth Aadyant at Gomti Nagar in Lucknow. This is one of the latest and most sought-after residential projects in the city that is brilliantly designed to complement your lifestyle. Aadyant is one of the most-awaited residential projects in the ‘City of Nawabs’ offering a quality-living to the residents. Designed with an aim to redefine the luxury living, the Aadyant project is setting benchmarks of innovation in the city. Aesthetically sound and minimalistic in design, the project is designed keeping in mind the comfort and requirements of the modern homebuyers. The exclusive structure of the estate is planned brilliantly for those seeking the utmost privacy. 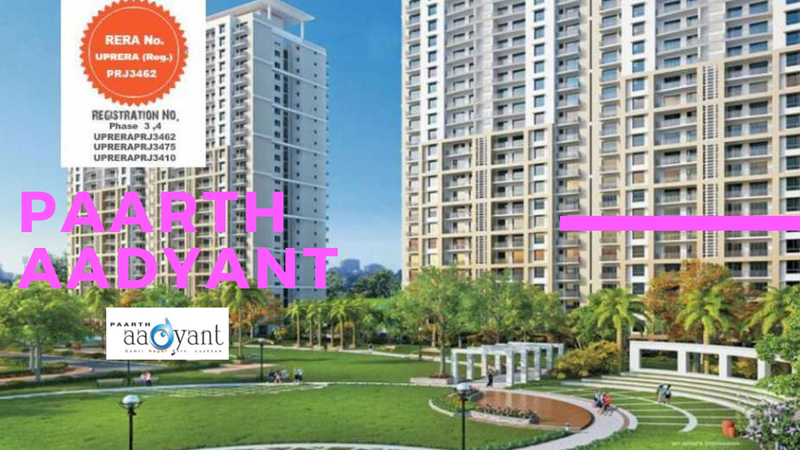 Paarth Aadyant is one of the most promising residential developments in the city planned over 14 acres of luscious land. Sophisticated interiors along with the intelligent floor planning at these apartments will redefine your living in a true sense. The 2 and 3 BHK apartments in the estate are brilliantly customized for the high-end and mid-range homebuyers. The apartment area varies from 1213 sq. ft. to 1460 sq. ft., ensuring a luxurious space to enjoy a comfortable life with family. The world-class residential units at the estate are designed to meet the expectations of the modern homebuyers. There will be 576 luxury apartments in total, planned in 6 residential towers in G+24 floor structure format. The realty market of the city Lucknow is booming and Aadyant project is also luring the investors and homebuyers to invest in a property for so many reasons from the superb features to its price and then the premium location. 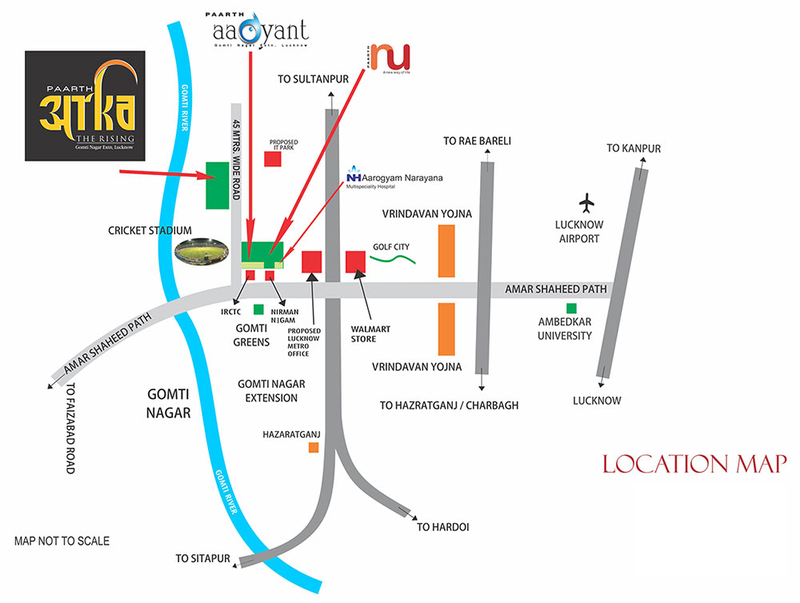 Located at Gomti Nagar Lucknow, the development offers easy connectivity to all the premium landmarks in the city. The social infrastructure surrounding the development is also well-developed and making the life of residents so convenient. Major schools, hospitals, universities, banks, basic convenience stores, etc. come in close vicinity. 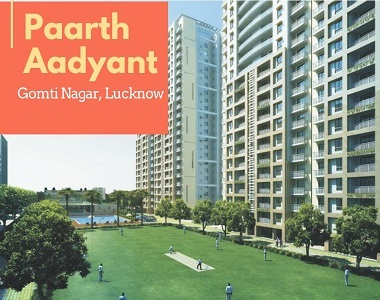 As you will step out from your home at Paarth Aadyant Lucknow, you can easily access the basic conveniences without spending hours in traffic as everything is located closer to the project. The project is centrally located and offers an easy access to all the corners of the city. Apart from this, the area is growing brilliantly to become an IT and commercial hub of the city. Surrounded by beautifully landscaped gardens and open spaces, Paarth Aadyant Lucknow will offer you a healthy and green living amidst nature. The development ensures a comfortable lifestyle of unmatched quality with its ultra-modern and luxurious facilities including a grand clubhouse, swimming pool, gymnasium, Intercom, golf course, walking the track, jogging track and more. The gated community ensures a safe and secure living with its world-class safety features including manned and video security, earthquake-resistant building, fire fighting systems and more. The beautifully landscaped gardens will totally immerse you in the beauty of nature that you will enjoy for sure. There are sitting and walking zones all around the complex where you can sit calmly and can spend your leisure time with other residents. The development ensures an ultra-modern living at really affordable prices. 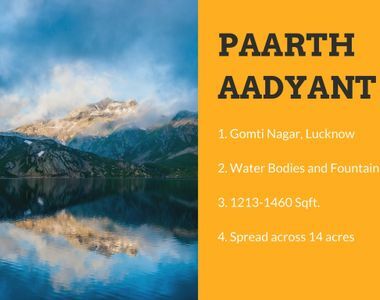 Paarth Aadyant price is exclusive and starts from 44.88 lakhs to 54.02 lakhs, customized as per the apartment area and configuration. Those willing to buy their dream home in Lucknow should have a look at this property to make a wiser decision. The property prices are also rising rapidly and it is better to book your home now. This is new tower of paarth aadyanta.location is near about it city and international cricket stadium.